The 2017 Acura MDX has been catching a lot of attention recently, thanks to its flashy new grille design and other design tweaks from the 2016 MDX. But what else has changed on the 2017 MDX vs. the 2016 model that buyers should be aware of? If you’re deciding between the two before new 2016 inventory runs out, keep reading to discover all of the changes made between the 2017 Acura MDX vs. 2016 Acura MDX! Acura’s plated logo grille has been a staple of Acura designs for the better part of a decade, changing only slightly in variation over that time period. 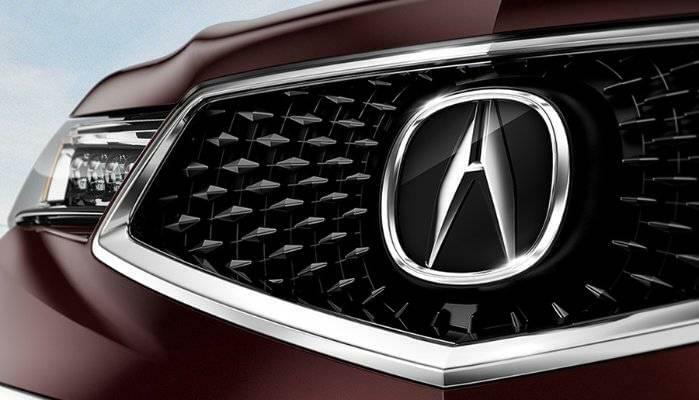 But as design trends mature, Acura has brought a new pentagon grille with a more pronounced logo to the MDX. First seen on the company’s Precision concept car, the 2017 MDX is the first production Acura model to feature the new grille design. The front end received the majority of the other design changes from the 2016 model year, sporting a much more aggressive look overall. Restyled LED headlights provide the new MDX with a more angular look and feel, along with a hood and front fascia that almost look sports car-esque. Moving along to the back, you’ll notice both sides of the 2017 MDX now feature chrome rocker panels. This small touch might not be noticeable on first glance, but it does make a difference in the overall styling on the new model. At the rear, the first thing those familiar with the MDX will notice is the return of the exhaust tips. With a sharp, angular-shaped design, the new exhaust tips do provide the 2017 model with a more sporty appearance that now rivals its competition. In previous years, there is no doubt Acura had put design second to performance, reliability, and fuel economy. But with this refresh, Acura simply improved the design while maintaining its position in the areas it’s known for. The inside of the 2017 MDX may look a little more familiar to the 2016 model than the exterior does, but Acura has made some worthwhile improvements to the interior. One of the biggest changes is the change from a manual, foot pedal parking brake to an electronic parking brake that keeps you vehicle in place with just the push of a button. But that’s not the only braking upgrade: the 2017 MDX also features automatic brake hold, which allows the driver to push a button and be able to freely take their foot off the brake without worrying about the car rolling forward. Once you hit the gas, the brake hold is disengaged, and you’re off. 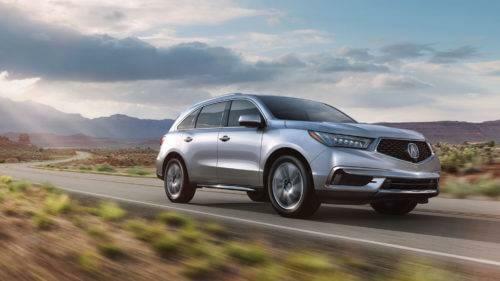 Acura has gone above and beyond to add even more value to the MDX for the new model year. One of the biggest changes is the addition of AcuraWatch to the standard features list. So even without a package upgrade, buyers will be able to take advantage of AcuraWatch’s incredible safety features. These include Lane Keep Assist, Road Departure Mitigation, Adaptive Cruise Control, and Collision Mitigation Braking. The restyled Jewel LED headlights also now feature auto high beams as a standard feature, which means the new MDX can sense when you’re approaching a car from behind, or a car is approaching you from the opposite side of the road. The MDX will then re-adjust the brightness automatically as the other car gets closer. To provide the MDX with even more of a luxurious, premium feel, gone is the classic gear shifter. In its place, a modern and cleanly-designed electronic gear selector. Operating this new shifter can take some getting used to, but it makes a big impact on the aesthetics of the new 2017 model. Considering the value packed into this package, the price is more than worth the upgrade compared to the 2017 MDX’s competition. 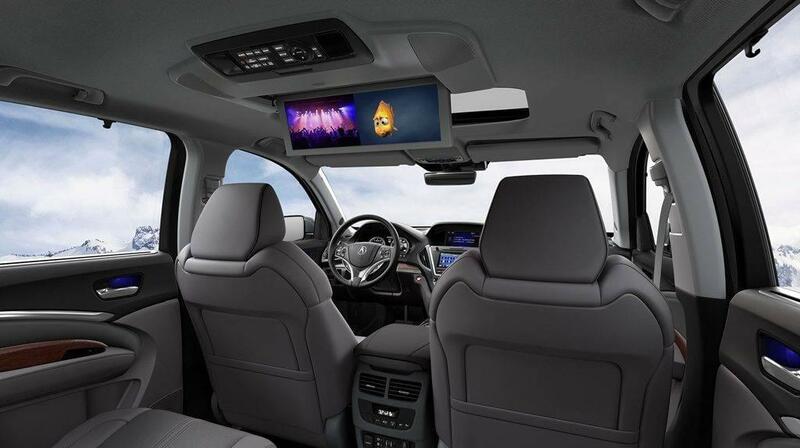 For those that want rear-seat entertainment, there are two options for this package: a 9-inch screen system when combined with the Technology Package or a 16.2-inch Ultra-Wide screen when combined with the Advance Package. Your backseat passengers also receive the option of heated captain-style seats (six passengers total), a dedicated rear center console with sliding tray, and second-row sunshades. So while the focus is on the front seat with the Advance Package, the kids will feel right at home too. Want to Learn More About the 2017 MDX? Click Here! Interested in a Certified Pre-Owned Acura MDX? Click Here!